Cooking Friend! I am so happy to share my recipe for Cheesy Quinoa Stuffed Mushrooms with you. 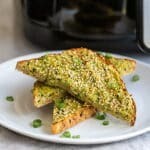 It’s one of my family’s favorite vegetarian recipes because it’s hearty, filling, satisfying, cheesy, easy and healthy. Sounds pretty great, right? 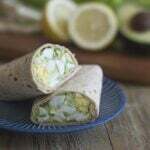 I partnered with Produce for Kids to bring you this recipe. There’s a constant tug-a-war in my house about healthy eating. The kids, of course, would prefer to just eat treats and fruit all day long. That’s not going to happen! But the real battle is between me, myself and I.
Here’s what happens: I write up a meal plan for the week. 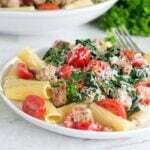 It includes a lot of vegetables and healthy grains, at least one vegetarian dinner, fish at least one night and small portions of chicken or meat on the other nights. That’s the plan. But as I race through the week and things are hectic and I get a bit tired or a bit cranky, I ache for a big plateful of saturated fat. Sometimes I develop a bit of amnesia. I forget about the plan I so carefully made and find myself baffled and confused in the check out line with a packet of sausages, a big block of cheese and a bag of potatoes. But other weeks I remember that there’s a hearty tasty (but healthy) meal coming up on the plan and I manage to stick to it. These Cheesy Quinoa Stuffed Mushrooms are one of those hearty tasty meals that help me stick to our healthy-eating plan. This vegetarian recipe comes together really quickly. You cook up the quinoa, add a bit of cheese, fill raw Portobello mushrooms with the quinoa and bake for a short time. The quinoa filling is so tasty that I often make a double batch so that I can use half as a side dish the next day. Or, I add broth to the quinoa and the kids take it in thermoses for their lunch. 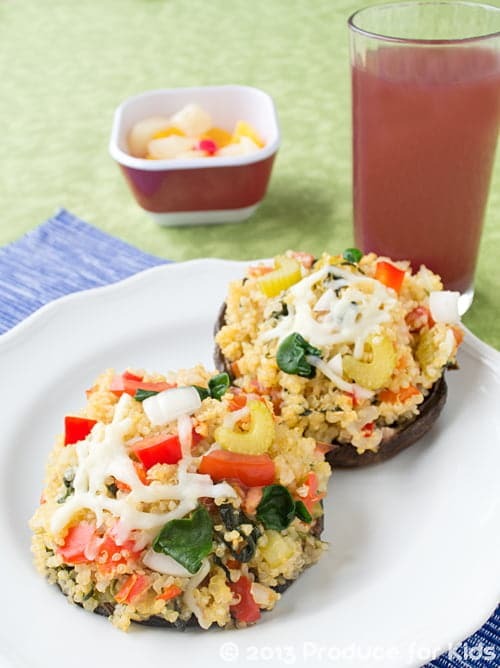 Click here to get today’s recipe for Cheesy Quinoa Stuffed Mushrooms from the Produce for Kids website. Why is my recipe on the Produce for Kids site? A few months back, Produce for Kids and I began working together to come up with family-friendly healthy recipes. I developed 7 recipes for them and photographed those and a whole bunch more. Now my recipes and pictures are on their site and I’m going to be telling you about them over the coming weeks. I’m always on the lookout for tasty hearty healthy vegetarian recipes. If you’ve got one up your sleeve, please help me out by telling me about it in the comment section below. Disclosure: I was paid by Produce for Kids to do recipe development, photography and promotion for them. This post also contains an affiliate link for a cooler, meaning that if you click it and then buy something I will receive a small percentage of the price. All opinions come from me and are honestly my own. Versatility is a great things…so is this recipe!